Stay-at-home father of three lively boys. Home safety is a number one priority when you are around this much energy and curiosity! I often wonder about how e-toys effect young children’s language development. With all the marketing hype about talking books, kiddy smart phones and other “educational” electronic toys, what toys should parents buy to support their children’s development? 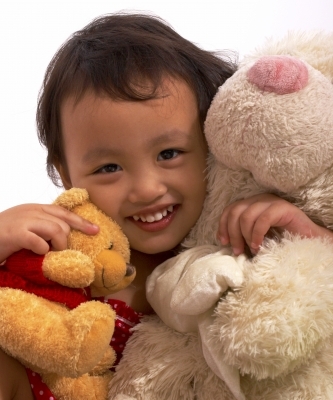 What toys should we, who support families, recommend to families with infants, toddlers and preschoolers? New research from Anna Sosa, Associate Professor in the Department of Communication Sciences and Disorders, Northern Arizona University explores these questions. She built on Hart & Risley’s long-respected language study linking the number of words children hear from their parents during the early years to later language development. The “30 Million Word Gap” - This phrase keeps popping up in community service programs and in the news media. Across the US, communities are launching public awareness campaigns and innovative programs supported by public and private funding to “close the word gap” by encouraging families to talk, sing and read every day with their young children. Learn more about new projects in Illinois, Oklahoma, Rhode Island and California.